Halloween is a week away, the days are getting shorter, my neighbors all have their scary bling out on their lawns … and I’m in the mood to be scared. Why, I even scared myself putting out the garbage cans in the dark last night. Oh how I love a scary movie — not horror per se, as I have a hard time with lots of blood & guts, but a movie that doesn’t let you blink as you watch that girl walk, slowly, slowly, down the hallway toward that room that she shouldn’t go into. My advice to those of you who agree: watch scary movies about mothers, starting with the fantastic “The Orphanage” (2007) and “Mother” (2009). The Spanish know how to make a damn good scary movie; more important, they’ve raised the scary movie to a high art that touches on fairy tales, politics, and history. See Guillermo del Toro’s “The Devil’s Backbone” (2001) if you need any confirmation — it set its scariness in a remote orphanage in the era of the Spanish Civil War to great effect. Juan Antonio Bayona’s “The Orphanage” (“El Orfanato”) is even scarier, and makes great use of three key scary plot elements: the haunted house, the protective mother-heroine, and the fractured fairy-tale fantasy of the child who never grows up. It’s the tale of Laura (Belén Rueda), a woman who left an orphanage as a child only to return as an adult with her young family to the same seaside building, long closed, with the plan to open a home for several developmentally disabled children. Her son, Simón, doesn’t know that he was adopted or that Laura and Carlos are carefully managing his HIV with a drug regimen. What Simón does know is the world of imagination: his imaginary friends follow him everywhere, so Laura isn’t surprised to find him in a cave on the beach, whispering to a new imaginary friend that he should come visit them at their big house nearby. Things get strange right away. An odd old woman with white hair and coke-bottle glasses shows up, claiming to be a social worker checking in on Simón’s progress — but she seems to have other, shadowy motives. Worse, Simón starts acting strangely. His new imaginary friend has arrived with no fewer than five others, making a small army to distract Simón from his close relationship with Laura. What is she to make of the fact that suddenly, her son has learned that she’s not really his mother and that his daily pills are designed to keep him from dying? How will she make sense of the strange new games Simón plays, games he couldn’t possibly have invented himself? But if Laura is our heroine in “The Orphanage,” we’re never quite sure what to make of the unnamed Mother (Kim Hye-ja) in Bong Joon-ho’s “Mother,” just released in the U.S. earlier this year. This film takes a David Lynchian perspective from the get-go, so we’re never quite sure whether to sympathize with her or expect her to start stabbing people. She earns such a small amount selling medicinal herbs from her little store that she secretly works as an unlicensed acupuncturist, despite warnings from the people around her that this might land her in jail or with an impossibly high fine. But she’s not overly concerned, because the one thing — the only thing — that occupies all the space on Mother’s frontal lobe is her son, Do-joon (Won Bin), a mentally handicapped young man who still sleeps with her every night, hand cupped on her breast. Because Do-joon is so simple, so suggestible, and surrounded by youths who alternately torment him and lead him into trouble, his mother’s attention is always distracted, watching him out the door, waiting for him to come home, picking him up at the police station. No wonder that when Do-joon is arrested on suspicion of murdering a teenaged girl in town, every unalloyed maternal instinct in Mother’s body drives her to prove he’s innocent. It’s enough to unbalance her already fragile life when she sees how easily the police convince her son to confess. She snaps into overdrive to find the real killer — hunting down leads, finding new evidence, interrogating suspects — but all of it with such a sense of mypoic, frantic determination that we start to realize that this film is perched directly in-between murder mystery and horror. “Mother” is an emotional thriller of the very best and most original kind, as the only convention it draws on is our belief in a mother’s love for her child — even as it twists and turns the positive connotations of mother-love to tweak our anxieties about such primal emotions. 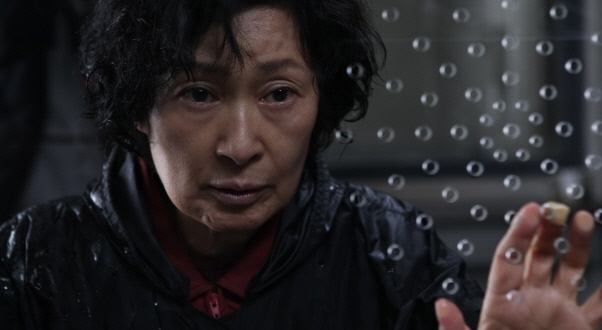 Best of all, Kim Hye-ja’s performance is riveting, one of the best I’ve seen all year. She plays this role as sympathetic, unknowable, and terrifying with such rapid-fire alternation that you don’t want to blink lest you miss the changing expressions on her face. This is the woman who should win the Academy Award for best actress this year — and for that matter, the film’s screenwriters and director should be right up there with the top films, too. I say indulge yourselves. Turn out all the lights in the house, pour yourself a cup of tea, snuggle up on the sofa under a blanket, and pop in the DVD for a night of wide-eyed pleasure, mixed with a few gasps and “oh no!”s. Halloween comes but once a year; this is a great way to celebrate.